The 6,000-plus spines protruding from a hedgehog’s back make this prickly customer a truly unique British mammal. Once called ‘urchins’ because, like the sea urchin, the hedgehog’s spines shield it from predators, this vocal, yet solitary, creature is mostly nocturnal, spending the nights grunting and using its pig-like snout to snort through under-growth in search of food. Worms, insects, snails and birds’ eggs are all on the menu. As a gamekeeper, I’ve known rogue hedgehogs to kill pheasant poults. They’re also efficient predators of the eggs of partridges and other ground-nesting birds. When you see a hedgehog-whether it be a boar, a sow or a hoglet-it usually looks as if it’s moving quite slowly. However, when it wants to shift, its legs are relatively long compared to the size of its body, and it can remove itself at a fair rate of knots. Of course, if all else fails, it can resort to its best defence: rolling up into a ball in the blink of an eye, its spiky outer coat protecting its soft body parts. Many a terrier has sustained a bloody nose from this most ingenious of manoeuvres. Hedgehogs have always had a love-hate relationship with man, and it would seem that their unusual shape and bristly coat have long fascinated us. Indeed, a carved figurine of a hedgehog found in the grave of a prehistoric baby at Stone-henge is believed to be Britain’s earliest known toy. The Romans made combs from dried hedgehog skins and Henry VIII offered a bounty of 4p for dead ‘hedge pigs’, as the Tudors believed that the hedgehog sucked milk from cows’ udders. We used to eat these funny little creatures, too-usually baked in clay to remove the spines. An old Romany gentleman once told me that hedgehog meat is extremely rich and that eating too much of it would finish you off. Repeatedly immortalised in fiction, hedgehogs continue to beguile-from acting as croquet balls in Alice’s Adventures in Wonderland to Beatrix Potter’s washerwoman, Mrs. Tiggy-Winkle, and the more recent computer-game character Sonic the Hedgehog. Once, when I was pigeon-shooting sitting quietly in Buggins’s wood in Nottinghamshire-I heard a strange rustling noise. At first, I couldn’t work out what it was, until I noticed some movement in the leaf litter, and out popped a hedgehog. I leant my gun against a tree and watched it beetling back and forth, pushing and packing leaves into a hole in the leaf litter trapped at the base of a holly bush. This went on all afternoon until the light faded and it retired into its new nest, with no trace of its hibernaculum on the woodland floor. 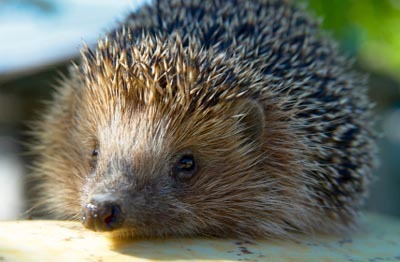 Once common throughout Great Britain, the hedgehog is, however, now in decline. According to survey work carried out by the British Trust for Ornithology for the People’s Trust for Endangered Species and the British Hedgehog Preservation Society, numbers have shrunk by 25% in the past 10 years. The grubbing out of hedgerows and a general decline in habitat is partly to blame. However, in my experience, the proliferation of agri-environment schemes in places such as Norfolk-where 6m (20ft) margins are used around fields to help encourage wild game and songbird populations-has helped to boost hedgehog numbers. This isn’t the case in areas with high densities of badgers-here, many country folk have reported finding just the skins of hedgehogs that have been predated by Old Brock. Hedgehogs aren’t immune to human ailments either. Like us, they suffer from cancer as well as liver and gastrointestinal disease. They’re famously flea-ridden, but it’s less well-known that, while trund-ling through hedgerow bottoms, they also spread ringworm and fungal infections, which can be picked up by dogs, particularly on their ears. Sadly, motorists regularly run them over, with an estimated 50,000 a year killed on our roads. And, given their reputation as a gardener’s friend, thanks to their healthy appetite for slugs, beetles and caterpillars, it’s a shame many hedgehogs fall foul of the over-zealous use of slug pellets. Ironically, the decision in 1974 to introduce a few non-native hedgehogs to the Uists and Benbecula in the Outer Hebrides to help control garden pests gave rise to a controversial cull of the animals in the early 2000s. After numbers of hedgehogs exploded to more than 5,000, Scottish Natural Heritage was forced to step in to stop the creatures decimating populations of endangered ground-nesting waders. As these island-dwelling hedgehogs have no natural predators, such as badgers, they can live for up to 10 years, producing four or five hoglets in each litter, so it’s no surprise they colonised the area so quickly. Nor, given our centuries-old anthropomorphism of Mrs Tiggy-Winkle et al, that their all-too necessary removal (and now translocation)-which has cost more than £1 million-would spark such an emotive debate.